We Inspire the Promise of Tomorrow! At St. Andrews, we are so proud to offer children a well-rounded and excellent early childhood education. Our long term and experienced early childhood educators have been with us more than a decade providing enrichment to the lives of preschool children from infants through pre-k. Additionally, we provide school age children from Bridlemile, Rieke & Hayhurst a fun environment in our after-care rooms. All of our children thrive in our spacious rooms, large, wooded playground and our full size gym. 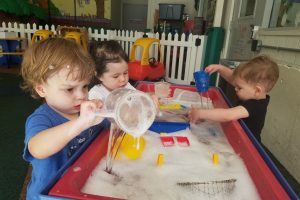 The teachers create a day full of play-based learning opportunities that are creative and open-ended, providing a developmentally appropriate curriculum that is just right for each age. We offer organic and vegan snacks. 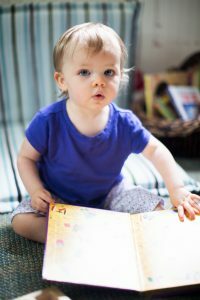 Nestled across the lower level of the St. Luke Lutheran Church in SW Portland is the year-round program for Infants-Wobblers-Toddlers (6 weeks through 3 years). We focus on fostering a child-centered, developmentally appropriate program for the littlest child. We provide a warm and nurturing environment which also includes educational play, physical and spiritual growth. Learning milestones in language, taking turns & sharing, seeking & exploring, listening and following instructions – to name a few. Our staff seek to encage your child while developing their skills. 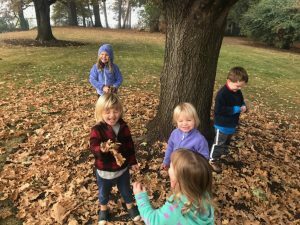 Our outdoor play space is accessed daily as well as our indoor rainy day space. At 3 years these children have a spot reserved at our St. Andrews location less than 1.5 miles away. Welcome to the beautiful University of Portland campus. We are in a remodeled home serving 16 children ages infants through pre-k. We believe that having a safe and loving home environment where children can spend time playing, singing, learning, and talking―are very important. Our dedicated staff nurture and embrace each child as he or she transitions through each stage of early learning. We have staff in the infant, toddler and preschool rooms that will engage and cultivate learning with your child. Join our happy kids. 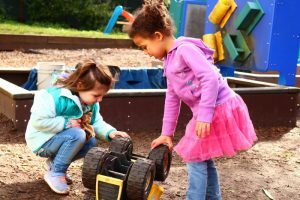 At the VA program we provide care for children as they develop and learn through academic play from Infants through Pre-K. We cater to the VA and OHSU staff as well as the community. The early years at the VA child development center are very important as each child’s health and development stages are pursued. We believe that children of all abilities, are able to grow and expand where their social, emotional and educational needs are met. We provide a healthy organic and vegan lunch with snacks daily.